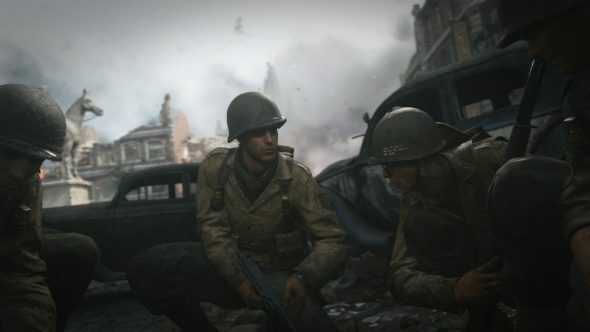 Update, May 4: Call of Duty: WW2’s multiplayer is once again free to play this weekend, and there’s a sale on it too. You can download and install the game’s multiplayer for free on Steam right now and play until Sunday, May 6 at 13:00 PST / 16:00 EST / 21:00 GMT. Much like the last free weekend (see below) there’s also a sale – 35% off the standard version of Call of Duty: WW2, bringing it down to $38.99 / £29.24 / €38.99, or 25% off the digital deluxe edition, which is $74.99 / £59.99 / €74.99. All of your progress from the trial will carry over to the full game if you decide to pick it up. Of course, with E3 just around the corner most of the attention is on the next game Call of Duty: Black Ops 4 – including the probable return of the perk system and that not only might the game ditch the single-player campaign for the first time, it could be getting a battle royale mode instead. Original story, February 23:Grab a buddy and prepare to mess up some zombies, because Call of Duty: WWII multiplayer is free to access on PC this weekend. Technically, the free weekend started yesterday, but it will run until Sunday, February 25 at 13:00 PST, 16:00 EST and 21:00 GMT respectively. During the free weekend, Steam is having a sale on the full game. There’s 35% off the Standard edition of the game, making it it $38.99 (£29.24) instead of $59.99 (£44.99). While there’s 25% off the Call of Duty: WW2 Digital Deluxe version, making it $74.99 (£59.99) rather than $99.99 (£79.99). If you choose to purchase the full title, all your progression, as well as inventory items and unlockables, carry over from free trial. If you’re on the fence, check out our Call of Duty: WWII review.